Microsoft Bing Ads at the yearly Bing Ads Next meet announced that an expanded partnership with Verizon Media will now give them the authority to exclusively serve Bing Ads to the users using Yahoo! Search engines. Shortly, Bing Ads, Yahoo!, and AOL (former Google Search Partner) will be simplified and all of the three search networks will be available under one roof Bing Ads and would be managed on the exact same global platform. 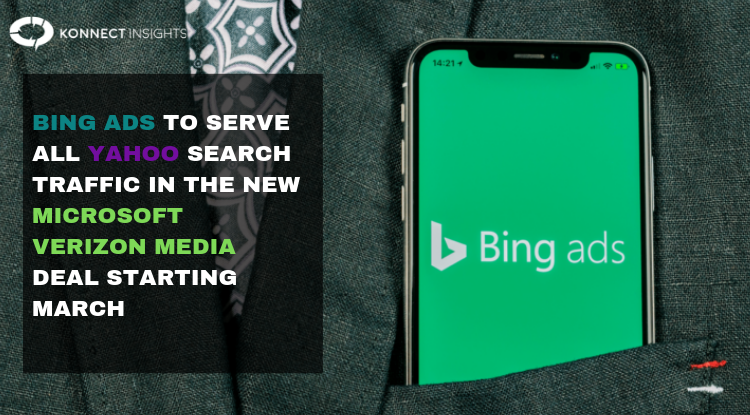 Based on the statement released by Bing Ads, the announcement of this enhanced partnership will help the advertisers with an increase in search volume. This partnership will make it much easier for the marketers to control search marketing campaigns. Furthermore, by aligning all campaigns under one platform Bing Ads, marketers will benefit from the Microsoft Graph combined with Microsoft artificial intelligence (AI) capabilities which will ultimately allow advertisers to target the ideal audience over any device. They also mentioned as their venture evolves, they will continue to work on consumer privacy and security as their core principles. Maintain budgets in the Oath Ad Platform throughout the transition period, to prevent any loss of volume. Beginning March 15th, copy all your ad sets from Oath Ad Platform and upload it on Bing, with a 10 percent increase in the budget just to be on the safer side. Ads will probably continue to function on both the platforms, therefore carefully analyze and track traffic, bids and budgets. Expected on March 31st, Oath Ads Platforms paid search traffic will cease entirely and 100 percent of their Yahoo Search Network traffic is going to be served by Bing Ads exclusively.